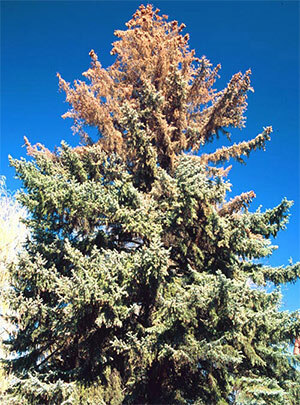 The IPS Beetle is a common pest of pine and spruce trees in the Denver, CO area, and highly dangerous to trees - it is one of the few pests that will kill it. Once a tree is attacked by IPS Beetles, the tree must be removed, as there is no cure. Like most bark beetles, IPS Beetles attack trees that are stressed due to drought or root damage. Thus, the key to preventing this insect from attacking your trees is to follow sound cultural practices that promote healthy trees. Donovan Arborists recommends staying consistent with deep root watering, fertilization and dead limb pruning to keep your trees vigorous and strong. Adult IPS Beetles are active from March through September and have many generations per season. Two sprays are required to provide year-long protection. Donovan Arborists can also apply the material directly into the tree for clients who want to protect their trees but do not want chemicals sprayed on their property. This method of application lasts for 2 years. Call us at 303-623-8733 or fill out our online form to talk to us more about your tree and property pest control needs.